1. 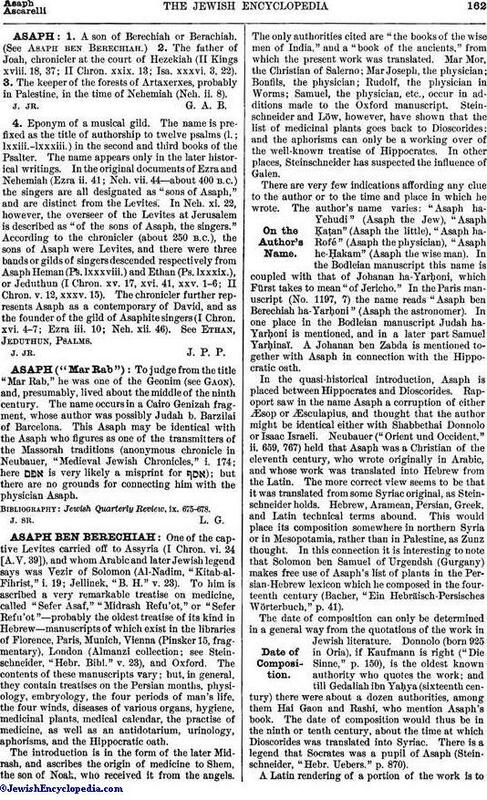 A son of Berechiah or Berachiah. (See Asaph ben Berechiah.) 2. The father of Joah, chronicler at the court of Hezekiah (II Kings xviii. 18, 37; II Chron. xxix. 13; Isa. xxxvi. 3, 22). 3. The keeper of the forests of Artaxerxes, probably in Palestine, in the time of Nehemiah (Neh. ii. 8). 4. Eponym of a musical gild. The name is prefixed as the title of authorship to twelve psalms (l.; lxxiii.-lxxxiii.) in the second and third books of the Psalter. The name appears only in the later historical writings. In the original documents of Ezra and Nehemiah (Ezra ii. 41; Neh. vii. 44—about 400 B.C.) the singers are all designated as "sons of Asaph," and are distinct from the Levites. In Neh. xi. 22, however, the overseer of the Levites at Jerusalem is described as "of the sons of Asaph, the singers." According to the chronicler (about 250 B.C. ), the sons of Asaph were Levites, and there were three bands or gilds of singers descended respectively from Asaph Heman (Ps. lxxxviii.) and Ethan (Ps. lxxxix. ), or Jeduthun (I Chron. xv. 17, xvi. 41, xxv. 1-6; II Chron. v. 12, xxxv. 15). The chronicler further represents Asaph as a contemporary of David, and as the founder of the gild of Asaphite singers (I Chron. xvi. 4-7; Ezra iii. 10; Neh. xii. 46). See Ethan, Jeduthun, Psalms. J. Jr. J. P. P.